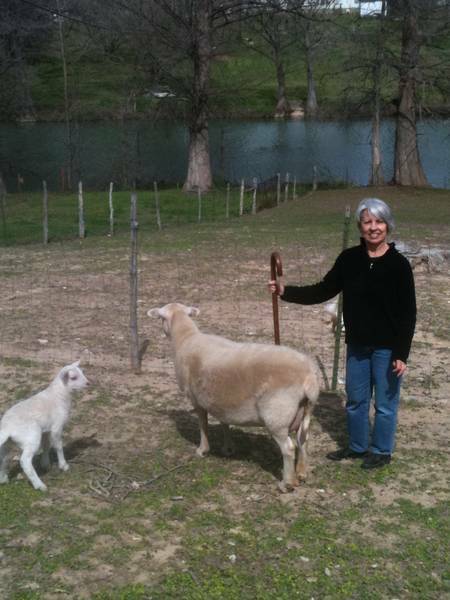 Hi Stephanie, this is my friend with a ewe and a lamb here in Castroville with her crook. She loves it. And her husband said it's a good thing I had her name put on it or he might steal it for walking. Thank you so much. The crook exceeded my high expectations. Always, Pam"
You will find the shepherds crooks that you are looking for at great prices. Please browse through our handcrafted shepherds staff products and review the product descriptions, images, and ordering information. As you browse our categories of shepherds crooks for sale, please keep in mind that each of our shepherds crooks comes with a satisfaction guarantee. We want to make sure you receive only a great quality shepherds staff and are satisfied with your order. Please be sure to contact us if you don't find what you're looking for or if you’d like us to make a suggestion on items for you. You can be confident as you shop with us. We work with reliable suppliers who understand our dedication to customer service and excellence in the shepherds staffs for sale that you purchase. We know that if you find what you are looking for that you’ll most likely shop with us again. We appreciate your business and hope that you’ll make us your online shepherds crooks store.